their deeds are vile; there is no one who does good. at the Christian audience. 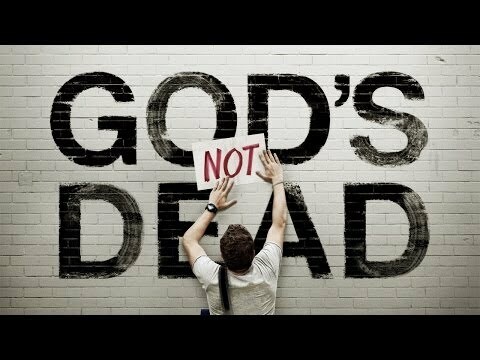 God Is Not Dead and Noah are two box office blockbusters that have been gaining a lot of ground in Christian circles. One is anything but a biblical based account of one of the most well known biblical characters of the Old Testament next to David, Moses and Abraham, while the other is definitely geared towards Christians and seekers alike. The Passion o f Christ swept us all up into a frenzy a few years back. It went so far as to even go authentic with language and use English subtitles in order to maintain the integrity of the New Testament’s usage of the Greek language. It caused a media frenzy. It caused an uproar among atheists. It caused much discussion on the depth of sacrifice that Jesus endured for our salvation. It hit right at the core of the soul’s dichotomy between humanity and holiness, total assurance and total depravity. It hit us all with shock value and made us look once again at the life and times of Jesus as well as His sacrificial work on the cross on Calvary. We saw a similar stir to a lesser degree with Kirk Cameron in Fireproof (2008) and Courageous (2011). Unlike Noah and The Passion, these were made by Christians and presented in a manner that was not offensive but undoubtedly had Christian values and principles oozing out of scene after scene. Outreach Magazine hosted movie discussions in theaters and churches all across the country with its church and para-church partners. Other faith-based groups hosted viewing nights as well. We got caught up in these movies and they offered us an opportunity to share the Good News in an environment where people could talk about Christianity without someone jumping on the defense on either side. God is Not Dead, on the other hand, is the type of movie that allows us to walk along with those who dwell in logic and philosophy with our Bibles and history books open at the same time. It offers us an opportunity to have an open dialogue about what can be done and how much we can explore beyond what we have heard from the pulpit or in Sunday School to truly defend the Gospel. We are under attack as Christians. If you did not know that, just go to your local movie theater. It’s right there on the big screen before your eyes. We have to make an immediate decision. I know that you were just expecting to some read some inspirational post on how to live as a Christian, skim a few pep-you-up verses or passages, then go on and live your life without any other bumps in the road. You need to make a decision> That’s right. Just like all of the rest of us who profess the name of Jesus Christ as Lord and claim to have His Spirit alive and dwelling within them, you need to decide what you will do for today and from now on. Will you live as a faithful child of God? You need to make a decision. Are you going to live like the example in the Word or the example of the world? Are you ready to live like the one who sacrificed everything to have a relationship with you, even while you were still a sinner? How will you live. . .? I started to realize that I had not changed much. No, I had aged somewhat. Years had been added to my span of life. But I had not changed much. Childish things that Paul wrote about in Corinthians were still present in my life. Childish ways still were part of my very nature and being. Childish words escaped from my lips as if I had to filter and the Holy Spirit had never come upon me, or even dwelled within me. I had not left the old man behind. I had come to realization that I had simply dragged him along, bringing him with me to the foot of the cross and walking away from the cross with him still attached as apart of me. I needed to live in the newness of of Christ. If I simply learned to live in Christ, I had a chance to live as a new creation in Paul’s words. I could begin to leave that old man behind and live as something new, different and changed in Christ. I have begun to make those changes. I have already started on my way. Pray for my victory over trials, tests and temptations. Pray that God be glorified, even in my down times, and that praise for Him continually be in my mouth. God is making a new me out of me, out of all the wretchedness of the filthy rag that I brought to Him when I accepted Him. We see it in numerous examples in the Bible. Lives projecting God-given drive and strength, tenacity and perseverance, are scattered throughout the Scriptures. Men in the Bible who lived without regrets had to include Stephen as he was stoned to death as a faithful believer. Paul must be on that list somewhere. Men who may have made mistakes but like Job they faced adversity with faith. There have to be some women on that list, too. Mary carrying and birthing the Lord. Martha giving birth to John after years of being barren. Look at Gideon and Isaac’s mothers, even the mother of Samuel. How about Esther and Rahab? They, too, had to be listed among the faithful who forged ahead in faith despite all that they had to face. I want to live such a faithful and enduring life without any regrets. I want to say that I laid aside every weight of the things that throw us off and get us down but ran my race with endurance. I simply wish for such a life led by the lord that I live without regrets. Take some time and read Hebrews 11, then read chapter 12:1-2. See if your faith isn’t raised a bit. See if you do not find yourself inspired to go a little further with your faith. Would you say that you have deepened your relationship with Him as you increased your knowledge and understanding of Him? If we want to grow in Him, brothers and sisters, we need to learn from Him. Our task is not simple as followers of Christ. We are pressed, pressured and persecuted for our beliefs. In order to withstand the devilish and wicked schemes of our day, let us continue growing our faith by following the lead of the teachings and sayings of the Master, the Rabbi and the Holy One of God- Jesus Christ. God offers us peace if we will simply rest in Him. Ever felt like it was a bad day getting worse? Ever felt stress mounting up like a volcano ready to erupt? A few years ago, I was introduced to Dietrich Bonhoeffer through a play that depicted an interaction between Dr. Martin Luther King, Jr. and Dietrich Bonhoeffer. Ever since that introduction, I have read something by Bonhoeffer at least once a year. Recently, I continued reading Life Together by Bonhoeffer. Undoubtedly, it reminds me of the kindred spirit that Bonhoeffer offers me through his discourse on the concept of community to people of faith. In all fairness, Bonhoeffer shares some inspirational words that should cause us all to pause for a moment and realize the true value of our Christian community despite the shortcomings and mistakes of our humanity. I also started reading I Want to Live These Days with You, a daily devotional by Bonhoeffer. I had read through it previously back in 2006 and 2009. As I prepared for 2013, I decided to return to the devotional once again. I had done the same with My Utmost for His Highest by Chambers and Morning and Evening by Spurgeon. I suggest that most believers could glean something from Bonhoeffer’s writings. He provides the reader with both inspiration and insight. Write your heart out at iWriter!